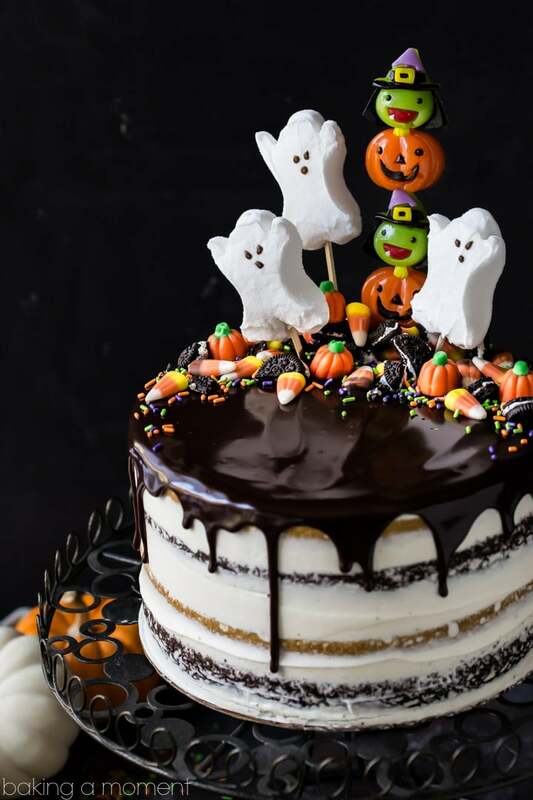 Make this pumpkin chocolate Halloween cake for your holiday celebration! With its spooky stripes and festive garnishes, it will be the hit of the party! Ok so we are *nearly* mid-October (eep!) so I think it’s about time to start breaking out the Halloween desserts. Hooray! 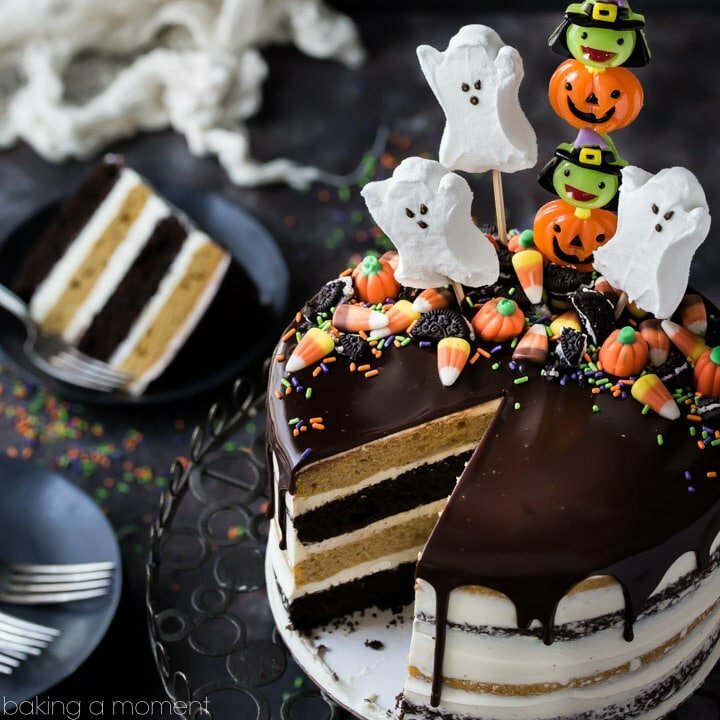 What do you say we kick off the season with this spooky and fun Pumpkin Chocolate Halloween Cake! What do you think? Alternating layers of spiced pumpkin cake and my most favorite moist chocolate cake, filled with silky vanilla buttercream and topped with a drippy dark chocolate glaze. Looks pretty impressive huh? I bet this would make a big splash at a party! Real talk: sometimes just the thought of making a layer cake gets me all sweaty. I know! What is my problem?? I make desserts all the dang time, layer cakes should be a breeze for me. I can’t explain it, but I often get stressed just at the thought of it. Well, this one was really pretty siimple. True, there are a lot of components, but you can make almost all of them ahead, and the decorations guarantee that this cake will be an absolute stunner. With minimal effort! It’s as easy as scattering on some store-bought Halloween candy. I baked the layers on day one, made the frosting, assembled, glazed, and decorated it on day two. And still had time to snap all the pics before the sun went down (which is happening way too early these days, btw). In fact, I really think it helps a lot if the cake layers have a night in the fridge. Somehow, the cake holds together better, is less crumb-y, and seems to become more moist as it chills. Just wrap them up tightly with plastic wrap so they don’t dry out. How do you like the “naked cake” look? Where the frosting on the sides of the cake is really thin, and you can see the layers peeking through? I think it’s cool, especially when the cake is kinda different and eye-catching, with alternating black and orange stripes. As for the garnishes, they really make the whole presentation. The tall, witch-pumpkin thing is a gummy lollipop I found at my local supermarket. The ghosts are marshmallow peeps, stuck onto bamboo skewers. Candy corn and mello-creme pumpkins are scattered around the one side, and chopped Oreos and festive sprinkles fill in. It’s super simple and gives such a fun look to this pumpkin chocolate Halloween cake. 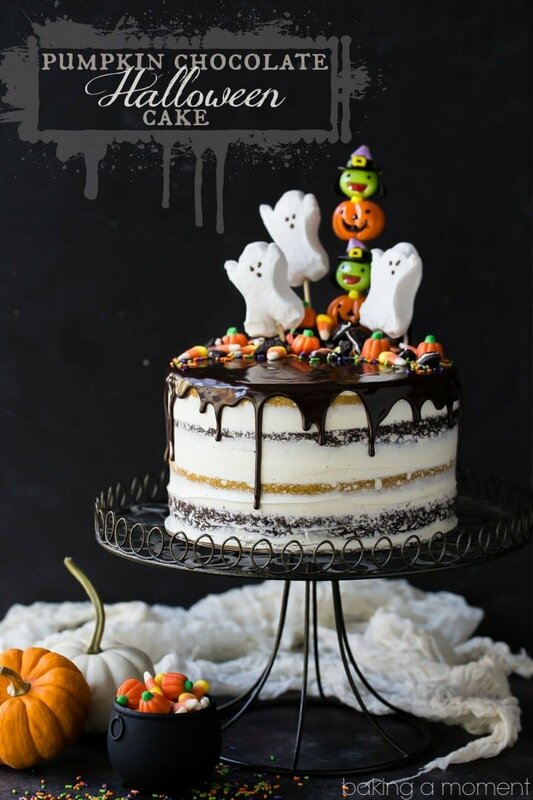 If you have a Halloween party coming up I really think this cake would be a perfect addition to the table! Check out this page for lots more fun Halloween dessert ideas! Garnishes: gummy pops, marshmallow ghosts, mello-creme pumpkins, candy corn, chopped Oreo minis, and sprinkles. Generously mist two 8-inch diameter by 3-inch high cake pans with non-stick spray, and line with circles cut from parchment paper. Place the flour, sugars, baking powder, baking soda, salt, and spices in a large mixing bowl and whisk to combine. Add the soft butter, and mix on low speed until the mixture resembles wet sand. Stir in the eggs, one at a time, scraping the bottom and sides of the bowl with a silicone spatula after each addition. Add the pumpkin, Greek yogurt, and vanilla, and mix on medium-low speed for about 90 seconds, to aerate the batter and develop the cake's structure. Bake for 15 to 20 minutes, or until a toothpick inserted in the thickest part of the cake comes out clean or with a few moist crumbs. Cool completely, then fill and frost with vanilla buttercream. Divide the batter evenly between the two prepared pans, and bake for 15 to 20 minutes, or until a toothpick inserted in the thickest part of the cake comes out clean or with one or two moist crumbs. Add the butter, a tablespoon at a time, whipping after each addition. If the mixture seems runny, place it in the refrigerator for 10 to 20 minutes, then re-whip. When all the butter has been added and the mixture is fluffy and spreadable, stir in 2 teaspoons of the vanilla extract. Place the cream in a large liquid measuring cup. Add the chocolate and corn syrup, and microwave on high for 15 second intervals, stirring, until smooth. Stir in the remaining vanilla extract, and pour the glaze over the top of the cake, allowing it to drip down the sides. Garnish with gummy pops, marshmallow ghosts, mello-creme pumpkins, candy corn, chopped Oreo minis, and sprinkles. I just want to scream!! This is GORGEOUS!!! Aw, you are the best! Thank you so much Zainab! Wow! What a stunner Allie!! I bet the boys loved this one! I’ve wanted to try my hand at a naked cake because I just LOVE the look but I haven’t been brave enough yet!! Well done!!! Don’t be intimidated Mary Ann! It’s way simpler than the old fashioned way. Takes off a lot of the stress! Thanks so much and I hope you had a great weekend! This cake is terrific!! It’s so beautiful and adorable! The chocolate ganache drippings are PERFECT, and I love how you decorated it. It’s really stunning! I love a naked cake because then I don’t have to worry about frosting it perfectly! So true Sarah! Between the store-bought garnishes and the easy frosting job, this cake was no sweat to make! Thanks so much; hope you had a great weekend hon! This is so cute!! Pinning! Thank you so much Sabrina and thanks for pinning as well! i mean this might just be my favorite halloween dessert. i’m slightly naked cake obsessed, especially with those pretty striped layers. And your toppings are fabulous! i’m so in love with this! It all works really well as a make-ahead Chad! I always stretch cakes out over at least a couple days. I like to refrigerate the cake layers after baking/cooling, and then frost them on day two. After that point, it can be kept at room temp for a day or so, or in the fridge if you have room. Either way! Good luck with the competition and have fun! I made these cakes today (they are cooling now). I only have 9 inch cake pans, so I used those instead, understanding that they would be shorter than the layers in your picture. The chocolate layers turned out well, even if they are a little shorter than I expected, they look almost normal height. However, the pumpkin layers are maybe only half as tall as the chocolate. They look like they didn’t rise at all. 🙁 I tore a small piece off of it, and it tastes good, but boy are they thin. Even if I had used 8 inch pans I don’t think they would have been normal height. Any suggestions? My pumpkin layers were a bit thinner too Lindsay, but I did use 8-inch pans so I’m sure they were still thicker than yours. I would definitely try to get your hands on a set of 8-inch pans, that’s really what’s needed for this particular recipe. I got mine at Michael’s for just a few dollars and they work great! Please do Dom! I’d love to hear your feedback. So happy you like the idea! Wow! They sure didnt raise very much. I used the 8 inch pan and the pumpkin barely got 1″ tall. Your picture makes the cake appear tall when done but I’m gonna be embarrassed by how “not tall” mine will be. Almost made me want to start over and use all the batter in one pan, then make another batch for the second pan. Is this how they should have been? I see others saying theirs was not raised either. Hey Denise! My layers weren’t more than an inch tall either. If you look at the pics of the cut cake, you’ll see what I mean. But there are 4 layers total, plus a fair amount of frosting in between. Once it’s all stacked up it looks right. Have fun decorating! You won’t get any argument from me Trisha! 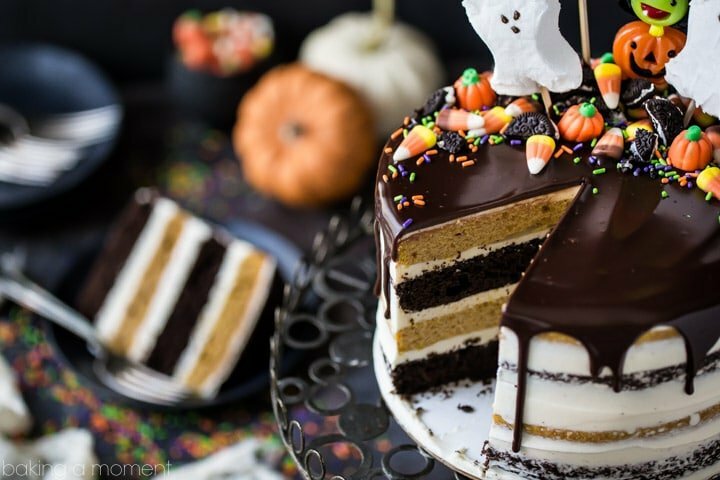 Beautiful Cake, I just love Halloween. I am planning on making this for my families visit next weekend. Do you think the butter cream will be okay if I make it the day before and refrigerate? If so, would I need to whip it again before using the following day? Hey Brandi! Thanks I’m so glad you like it! You have exactly the right idea- refrigerate it and then re-whip. I do it all the time and it works very well. Good luck and enjoy! My layers are pretty thin. Is that supposed to happen? Hey Amber! Yes the layers will be on the thin side. It’s a 4-layer cake, with filling in between each layer, so by the time you build it all up the cake will end up proportional. Hope that’s helpful! Hi just to be clear , the filling and topping is both the1. vanilla buttercream and 2. The chocolate syrup topping. I’m looking to do a 6″ version of this cake, a single layer of each. Reading a comment that said the pumpkin layers were quite thin, shoukd i keep the recipe the same instead of cutting in half? Hey Melissa! That would depend upon the kind of proportion you’re looking to have (diameter to height). If you like the look of the cake you see pictured, then do it that way. If you want it to look really tall and skinny, then bake it in a smaller pan. Hope that’s helpful! I’m just about to frost the cake, the batter tasted amazing BTW, but in the directions it doesn’t state when you should frost the cake. It sounds as though you’re supposed to use the frosting as an ingredient for the chocolate drizzle. What am I missing? I’m making this for a birthday party today. Thank you! Hey Sarah! You’re going to want to fill & frost the cake with buttercream once the layers have cooled completely. Then drizzle with chocolate glaze. Hope that’s helpful! This cake is as elegant as it is delicious! Perfect Halloween indulgence! This looks absolutely incredible! And so fun for everyone! World’s best Halloween cake, right here! This is the perfect dessert for Halloween parties! So spooky and fun! Everyone will love it! What do you do with the double cream ? Check out steps 6 & & under the Filling/Toppings heading. I’m in the process of making this tonight (or at least the cakes, to frost tomorrow) and wanted to share a couple of things and errors in the recipe as its written. I’m making this cake to donate to a bake sale for a school event. First, I read the comments about the pumpkin layers being thin so I doubled just those layers. And I thought it was crazy because even doubled and evenly divided (I weighed them as I filled the cake pans so they were almost 50/50 exactly, within a few grams), they are just barely an inch high! On the upside, they are SUPER flat – make sure you tap the pans on the counter to even the batter out, because it’s thick and so it will not spread like a more fluid batter, so those weird imperfections will probably be evident but its being frosted so who cares. These are probably the flattest cakes I’ve ever made – I don’t even think I will have to trim them, much to the dismay of the rest of the household who is used to being able to eat cake trimmings. I was slightly disturbed when I weighed out the chocolate layers…. the pumpkin layers came out to something like 550g each (I can’t recall exactly but it was in the 500’s) so when I weighed the chocolate layers, I freaked out a little bit internally when they were only around 320g each. Maybe I should have doubled those too?! But it was too late. That being said, the chocolate layers are still in the oven but they appear that they will come out fine?! Baking chemistry is weird… oh well, moving along. – In the pumpkin layer directions, it specifies baking soda as an ingredient but does not mention it in the directions. I thought maybe that was why so many people had short pumpkin layers but I’m positive I added it so I don’t think so. – I had to bake it for 25 minutes, but that was probably because I doubled it and it was thus thicker. – When reading the ‘Fillings/Toppings’ part, it’s confusing and I can see how another commentor was confused. This section appears to be both making a frosting for filling/frosting AND also making the glaze. But the two components are not separated in any way. Its like it just says mix all this stuff together and then suddenly you’re making the glaze. So it appears that you are just making one thing. I spent quite awhile looking for a decent vanilla buttercream frosting before realizing there was one already included with the recipe. – I wish that the recipe didn’t specify so many times to specifically use a 8×3″ pan, because I actually went out and bought 2 of them (I only had 8×2″) thinking that the ones I had would be too short 🙁 And I totally did not need to. Anyways, those were my observations! I wish that I had some trimming to do so I could taste it since it is being donated and I won’t get to eat it 🙁 The chocolate batter tasted absolutely divine so I will have to make that one again soon! Feel like I’m doing something wrong with the pumpkin cake layers….they don’t rise. Quite flat. Tried them twice with same results. Chocolate not much better but not quite so pancake looking. Hey Martha! I’m so sorry you’re having trouble. Are your layers baking up flatter than what you see in the pics? I did design the layers to be on the thinner side, since it’s a 4-layer cake and I didn’t want it to be too tall and wobbly. One tip I would give is to try straining your pumpkin puree before adding in to the cake batter. Sometimes pumpkin puree can be very wet and heavy, and that can prevent your bakes from rising properly. I hope this is helpful!